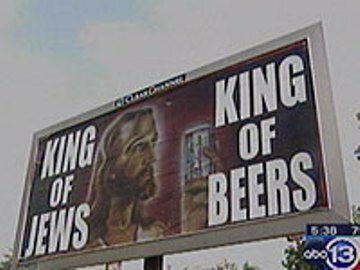 According to Best Week Ever, this is the work of vandals in Texas, but knowing what I know about Texas I wouldn't necessarily discount the possibility that it's a new ad campaign whereby everyone will purchase the beer endorsed the Savior of Man. Screw water into wine. Beer me, Hay-Suse!